1991 touts a long history in the aftermarket performance market and it speaks to the trustworthiness of products that are designed and manufactured by a company whose history dates back that far, and AWE Tuning Exhaust is such a company. AWE exhaust has a commitment to product quality and to performance enhancing your vehicle is the secret to their success and this commitment manifests itself throughout the entire production process from innovation to design and through to quality control. By having the facilities to do everything in-house AWE tuning exhaust can carefully monitor every aspect of production and their top of the line designing and machining tools aid them in everything from prototyping to manufacturing, and the piece de resistance is their official tuner status at the New Jersey Motorsports Park. A company like AWE exhaust cannot stay ahead of the competition by being complacent and they certainly are not that because they are always striving to make a better product that will improve your vehicle’s performance and keep you as a satisfied customer. The team at LMPERFORMANCE knows you love your Porsche and so do we and we know you are a performance aficionado if you own one so we know you want only the best when it comes to performance enhancement and AWE tuning exhaust has made it their business to see that you get just that with their sui generis products for the discriminating driver like you. Products like the SWITCHPATH AWE Exhaust System for your Porsche 911, 912, 930, 964, 993, 996 or 997 that is not only a track exhaust but is a touring exhaust as well and this is all accomplished by the nonpareil “SWITHCHPATH” valve designed to direct exhaust gasses away from the side mufflers. The way it works is this – with the valve closed your Porsche’s exhaust gases are released by way of your stock muffler and you experience that impressive AWE exhaust touring tone only slightly louder and then with the “SWITCHPATH” valve open your exhaust gases are directed away from the side muffler and you get that more aggressive sound. All of this is in response to the exhaust valve position commands sent by your Porsche’s very own ECU depending on your throttle output so that your individual driving style is the determining factor in exhaust volume. You can make your exhaust look as good as it sounds with the piece de resistance, those impressive tips that are available in chrome silver or diamond black; and of course, if simple and sophisticated is more your style then they are available with no tips. If you choose tips then there is no worry about heat discoloration because the AWE tips are double walled and no concerns about quality because they are one hundred percent T304 stainless steel and have a nice finish with the beveled edges. AWE is so confident that you will be regaled by this exhaust that they offer an outstanding guarantee and allow you to return it within thirty days from the purchase date – so no fears there. Let AWE tuning exhaust help you get the sound and performance gains you want from your Porsche and let LMPERFORMANCE give you a competitive price and free shipping. With over twenty-six years in this industry, the premium performance upgrades from AWE Tuning are now available at LM Performance! AWE Tuning has one vision: To Unlock Performance. From award-winning handcrafted performance exhausts, to track-tested carbon fiber intakes and performance intercoolers, AWE Tuning innovates, designs, manufactures, retails and distributes AWE Tuning brand performance products globally through its preferred network of dealers, online and from its state-of-the-art headquarters outside of Philadelphia, Pennsylvania. 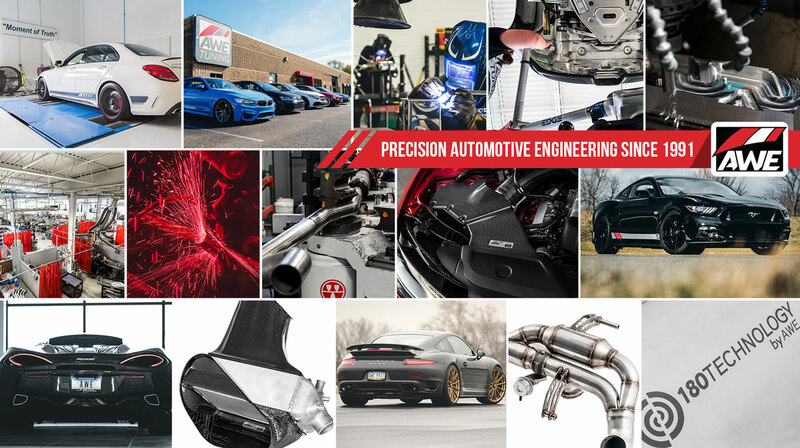 Since 1991, AWE Tuning's elite team of researchers, engineers, innovators and drivers have track-tested and introduced premium performance upgrades for some of the finest automobiles in the world. A recent carbon fiber intake had over 350 in-house hours of development and testing behind it. Needless to say, the company’s people are fanatically committed to the business of performance. By controlling every facet of development it is able to guarantee effectiveness and quality like no other. Its laboratory consists of CAD tools and CNC machines. Its all part of the company’s DNA, from prototyping to manufacturing to testing. The bottom line, in-house means in control – and that’s where you want to be. Put simply, the company’s culture revolves around one vision: To Unlock Performance. You have it in there... it's just about unlocking it. With every CAD rendering and every test run, AWE ask themselves, "Can this be better? Can we unlock more performance?" Whether it’s choosing the next intercooler design or fabricating one of the signature 180 Technology® exhausts, the company is filled with fanatics and enthusiasts, committed to performance, all without ever sacrificing any of the practicality that you've come to rely on. In other words, AWE Tuning’s mission is to become the most trusted partner in precision automotive engineering for enthusiasts like you.